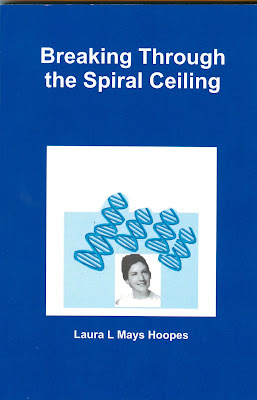 I can definitely relate to Laura L. Mays Hoopes memoir, Breaking the Spiral Ceiling: An American Woman Becomes A DNA Scientist (March 2011). She and I grew up at the same time, and we both entered careers in the scientific and engineering world. We also both experienced the inequities between men and women that abounded in that world. Though I am not a trained scientist as Laura (Laura got her Ph.D from Yale), I worked as a technical writer, editor and proposal manager in the aerospace industry and trained many scientists and engineers to write. However, Laura is not a scientist who needs writing help. Her memoir is easy to read even for non-scientists like myself, and her voice is humorous and friendly. Not only does she tell the struggles of moving up the spiral ladder in her scientific world, she shares her life as a wife and mother. During that time if woman wanted to make it in the â€œmanâ€™s world,â€ she had to prove herself way more than her male colleagues. Plus, she couldnâ€™t let her life outside of work interfere or take precedence over her professional endeavors. Lauraâ€™s book is so inspiring, because she shows how she was able to do it all. In fact, she is still doing it as a professor at Pomona College in Claremont, California. Unfortunately, many professional women are still struggling with inequities in the workplace. For those who are I recommend the lessons and inspiration in this book. Laura L. Mays Hoopes is a biologist turned creative writer. She is the Halstead-Bent Professor of Biology and Molecular Biology at Pomona College in Claremont, CA. In June, 2009 she received a Creative Writing Certificate with Distinction from UCLA Extension. Laura has written Breaking Through the Spiral Ceiling, a memoir about growing up in the Eisenhower years, being recruited to science by Sputnik, falling in love with DNA, and crashing into gender-barriers in molecular biology. She is working on two novels and a biography of two prominent women in molecular biology, Joan Steitz and Jennifer Doudna. Her shorter work has beenCeiling published in The Chaffin Journal, North Carolina Literary Review, Christian Science Monitor, Rose City Sisters, The Scientist, AWIS Magazine, and other magazines and newspapers. One of her stories was a finalist for Story of the Year on Rose City Sisters online anthology in 2009. A poem about Chopin came out in March, 2009 in Chopin with Cherries anthology (Lulu availability). Laura enjoys the Inland Empire California Writers Club where she is President and Editor of the Fresh Ink newsletter. Please visit her website.